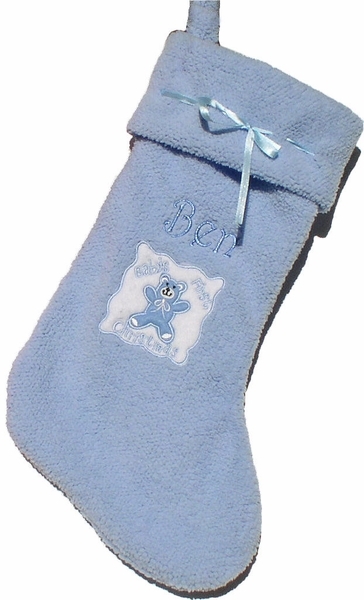 Baby's First Christmas stocking is terry material with fine applique of a teddy bear and Baby's First Christmas with a blue satin ribbon. It is made of the softest material that you just want to cuddle with. It does have a matching pink stocking if you want to make a set. Materials: Designed with the highest standards luxury materials. The outside is made from the micro fiber softest terry you can immagine. You know, the kind of material you want to hold and cuddle because it feels so good to touch. Soft felt teddy bear applique. Sating Ribbon weaved through the cuff.